Baking is an activity that anyone who has an oven can easily do. Food you are able to bake at home may include cakes, muffins, and even bread. There are many types of breads that can be baked based on your needs and preferences. One option is to bake artisan bread to use as a bowl for a soup or a salad. There are many reasons to consider baking artisan bread at home. The biggest reason is the cost of the product will be far less than anything you can buy at a supermarket or grocery store. You may also find the taste of the bread is better than store bought artisan bread. The reason store bought bread may taste plain is due to basic ingredients. Bakeries in grocery stores or in most supermarkets get ingredients in bulk to make large quantities. Your artisan bread is an item that will have fresh ingredients that will result in a superior tasting product. One aspect of baking bread is kneading the dough due to the use of yeast as an ingredient. 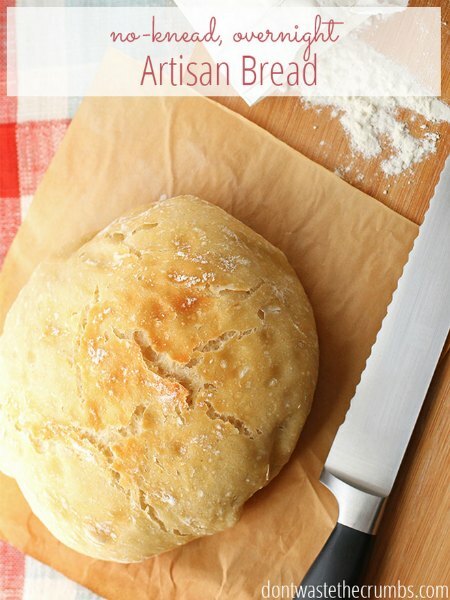 Kneading of the dough is not necessary when using this simple artisan bread recipe. All you will need to do is have the dough rest overnight before baking. All the ingredients that are needed to bake this bread at home may already be in your kitchen. The one ingredient you might need to get at a grocery store is fresh yeast. All you need to mix the ingredients for the bread is a suitable bowl. You do not need to use a bread pan to bake artisan bread. The only thing you need to do is to create the shape that is needed then to hollow out the bread to make a bowl. You can use the leftover bread to make an assortment of items like croutons.